Thecombinationof technologyand successful, evidence-based systems which consider holistic and not just performance related benefits as a means to providing healthcare in the future, will be the subject of a lecturethis weekbyNorman Black,University of UlsterProfessor of Medical Informatics. 'Connected Health: Are we at the Tipping Point, or Another False Dawn? 'the latest lecture in the NISP CONNECT, Frontiers in Science & Technology series, will take place tomorrow, Thursday November 29, 2012, at 12.45pm, in Clifton House Heritage Centre in Belfast. Connected Healthis awayof connecting patients to their healthcare providers via the technology now found in common household items, such as cell phones, computers, smart phones etc, and simple networked medical devices. It is a means of using technology to provide healthcare remotely - ie: patients with long term or chronic health conditions can be monitored and advisedby medical staff without having to come into a surgery or hospital. Technological devices and monitoring programmes are also being developed to enable the elderly and those suffering from dementia to retain their independence and remain living in their own homes for longer. Professor Black said: "As a result of demographic change, increasing age, growing disease rates and costs of health and social care provision, the demandon national health services is immense. “There can be little doubt that thecase has already been made for a radical change in the delivery of health and social care across the globe, including Northern Ireland. “A growing number of international governments are looking to Connected Health as the basis of the new world delivery systems. 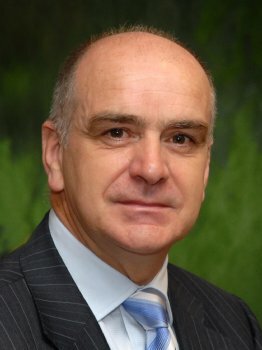 “There are many challenges associated with the development of Connected Health which will need to be addressed and funding for further research and investigation willbe required to make progress.The question is, how best to address these challenges and, in particular, those of particular relevance to NI. “In this presentation we will consider the practical factors associated with the development, uptake and future developments of Connected Health systems. NISP CONNECT programme manager, Peter Edgar added: “The Frontiers in Science & Technology lecture serieswas launched inJune 2012,with the aim of enhancingdialogue between the business community and Northern Ireland’s leading scientists, engineers and researchers. “These frequent lunch seminars provide access to a number of cutting-edge research efforts underway within Northern Ireland's leading research institutes. NORMAN BLACKis Professor of Medical Informatics at the University of Ulster. He worked for British Telecom for 14 years before joining the University of Ulster, Jordanstown, in 1985 as Lecturer in the Department of Electrical and Electronic Engineering, becoming Director of the Northern Ireland Bioengineering Centre (NIBEC) in 1992. He has held a number of positions at senior management level including Dean of Informatics, Dean of Engineering and Pro Vice Chancellor (Research and Innovation). Professor Black has extensive research experience having been President of the European Society for Engineering and Medicine (ESEM) and a Founder Member of the Institute of Telemedicine. He has significant Entrepreneurial and Innovation experience having been responsible for enterprise and innovation at the University of Ulster for several years. He continues to be active in research and has research interests include biomedical engineering, medical informatics, connected health, smart technologies, data fusion, and bioengineering education. NISP CONNECTis aleadership platform and catalyst between Northern Ireland’s entrepreneurs, research institutions, investors, technology corporations and professional service providers by linking entrepreneurs with the resources they need for success. NISP CONNECT is anindependent, non-profit organisation fostering entrepreneurship by accelerating the growth of promising technologies and early stage companies. A collaboration between Northern Ireland Science Park (NISP), the University of Ulster, Queen's University, Belfast and AFBI (Agri Food & BioSciences Institute), NISP CONNECT acts as an ‘honest, neutral broker’ within the region. NISP CONNECT focuses on: research institution support, business creation and development, entrepreneurial learning, access to capital, public policy advocacy, awards, recognition and networking… by mobilizing and leveraging the private sector’s best on a pro-bono basis. NISP CONNECT is part funded by the European Regional Development Fund under the European Sustainable Competitiveness Programme for Northern Ireland 2007 – 2013.